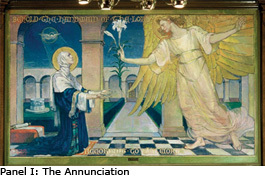 Mrs. Jennings approached Ms Oakley about painting an Annunciation scene in what was then used as the reception room for the church’s Pastoral Aid Society (the women’s organization of the church). Ms. Oakley, instead, suggested a series of murals, and Mrs. Jennings convinced church members to sponsor 10 murals as memorials.Ms Oakley’s commission was undertaken in the summer of 1945 (she was then over 70 years old) and the murals were completed in the spring of 1949. Violet Oakley (1874-1961) was perhaps the greatest woman muralist the United States has produced. She grew up in Bergen Heights, NJ and began studying art at age 18. She studied art in Philadelphia and England. She came from a family of artists. Both her grandfathers were members of The National Academy of Design. From the mid 1890’s until 1902, Ms. Oakley had a studio at 1523 Chestnut Street in Philadelphia. For the next four years, she lived in Villanova, PA. From 1906 until her death in 1961, Ms. Oakley lived and worked at 627 St. George’s Road in Mt. Airy, Philadelphia. Ms. Oakley was an Episcopalian who converted to Christian Science. She later became immersed in William Penn’s Quaker ideas of universal brotherhood, freedom of religion, and a world court of arbitration to supplant wars. Her political activity focused on international issues of world peace and disarmament. Ms. Oakley was a pacifist and a feminist of that generation of feminists that won the vote for women. Ms. Oakley began as an illustrator of books and magazines. She developed other talents: stained glass; designs for posters; work in charcoal and pastels; pencil, ink and watercolor on paper; oil on canvas. Ms. Oakley subsequently became noted for her murals/wall paintings: oils on canvas produced in her studio and later mounted on the walls of public buildings and private homes. Another mural of note was her “Apocalypse Triptych” for the Vassar College Alumni House in 1924. During World War II, Ms. Oakley created beautiful portable altar pieces for the Armed Forces. It was these beautiful altar pieces that caught the attention of Mrs. W. Beatty Jennings, widow of the former pastor of The First Presbyterian Church in Germantown.